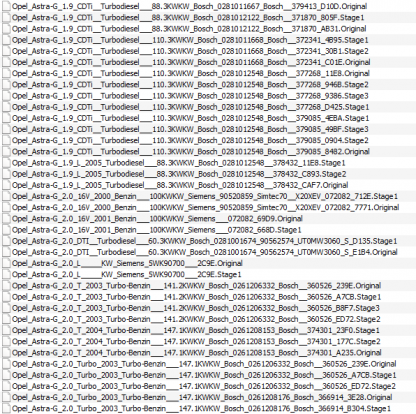 Database of ECU files for Opel includes modified and original files. 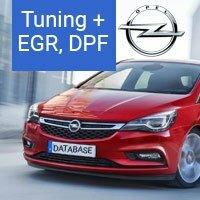 You can find removed DPF, EGR and tuning for Opel models with Bosch, ACDelco and Siemens Simtec 7.5 electronic control units. 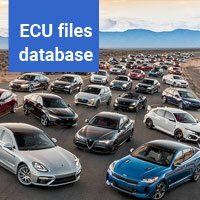 Opel Astra, Combo, Corsa, Insignia, Meriva, Movano, Omega, Tigra, Sifnum, Sintra, Vivaro, Vectra and Zafira are in the database. 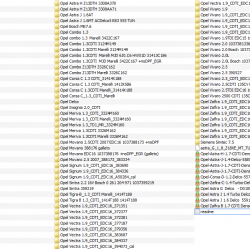 1.8 Gb of ECU files for Opel. 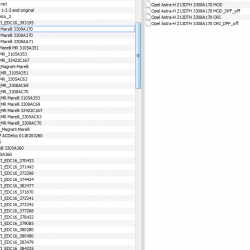 There are 1920 files: original and remapped for Tuning Stage 1-2-3 and DPF off, EGR off . Those solutions were tested. 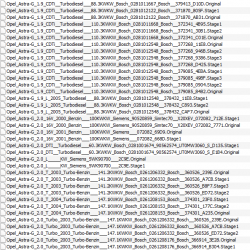 File names in the Opel database is understandable. Model, engine and software number are all most in all file names. “mod” = “tun”= tuning. 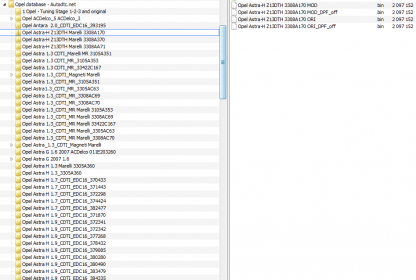 If “mod” or “tun” is in a file name it means this file was tuned. 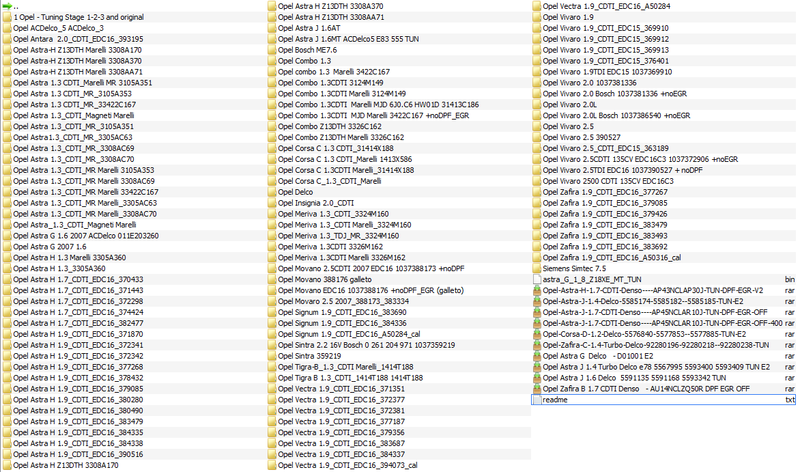 “DPF_off” = “no_DPF” = DPF is removed for this Opel ECU file. “EGR_off” = “no_EGR” = EGR is removed. 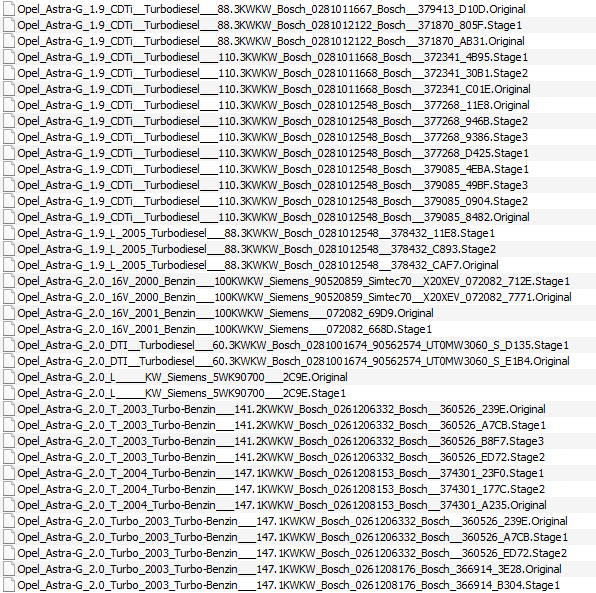 “ori” = “stok” = original file. A file have no modifications. 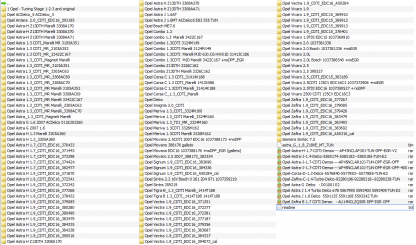 How to buy Opel ECU files database? Add the database to basket. Proceed to checkout and make payment online. 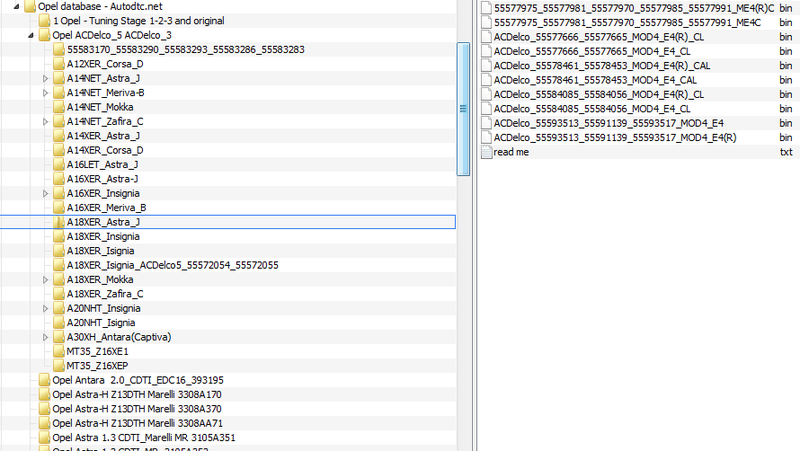 We will send a link for downloading Opel database to your email. It may takes from 30 min to 24 hours from payment receiving. Sometimes after writing full file the Simtec 7.5 ECU stops working properly and the car does not start. Therefore, There is strongly recommend to write only calibration into this unit. All calibrations within one software are interchangeable. L_e2_GBO – version for HBO. Opel Astra H, Corsa D, Combo, Meriva with 1.3 CDTI engine have Marelli MuliJet ECU. 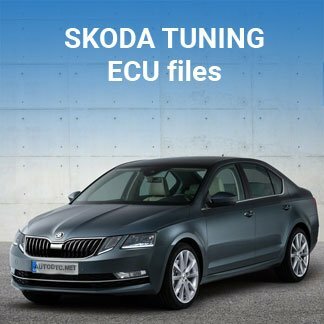 There was significantly improved dynamics, ensured smoothness in ECU files. 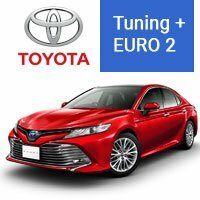 In tuning versions: the EGR valve is removed from ECU files (indirect removing: the valve is not controlled and does not participate in the engine, if necessary it can be physically muffled). 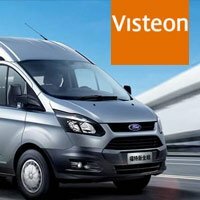 This allows to reduce fuel consumption with a significant dynamic improvement. It’s very important for files with a control of a diesel particulate filter (DPF): it is completely disabled and can be removed physically along with the catalyst. MPPS, Kess II can be used fo writing ECU files. Also you can use some other tool which working with those ECU through BDM and supporting all types of memory installed in them (for example Alientech K-TAG). 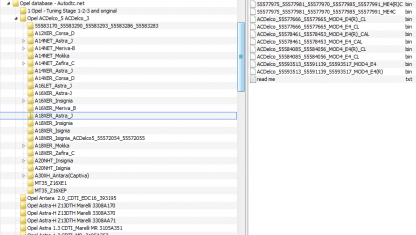 ECU files for Opel with Marelli MuliJet is presented mainly in a calibration format. 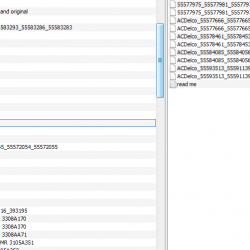 When you work through BDM this format can be easily imported into the full flash read by you. 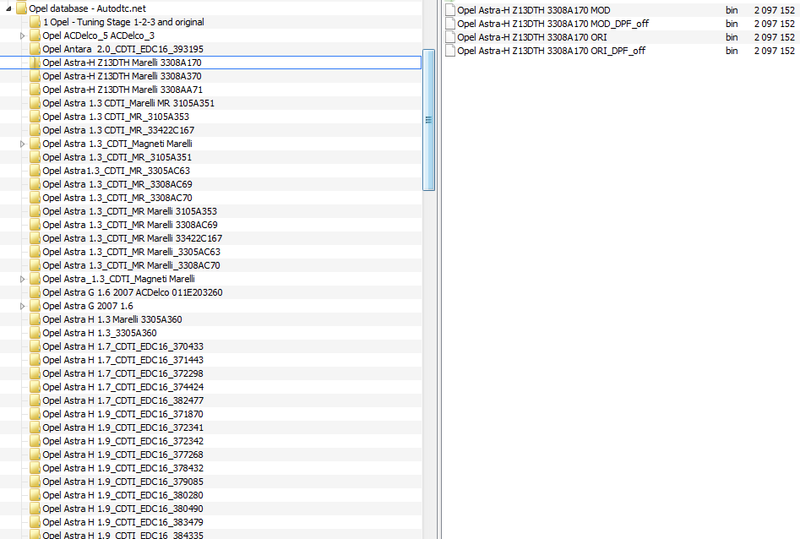 Some files are provided in full flash format.